Figure 1: About half of this tooth was chipped away in a street hockey accident. The chip narrowly avoided exposing the tooth’s pulp (blood vessels and nerve). Chipped teeth are more common in children and people who participate in sports. Chips in teeth vary in severity, depending on their cause. In children, front teeth are prone to chips, because they frequently project forward when they first come into the mouth—making them vulnerable to injuries. The teeth generally remain in such a position for a couple of years while the jaws are developing and the primary front (anterior) teeth are being lost. Children of that age often like to roughhouse with their friends and family members, and their teeth sometimes get in the way. Adolescents and adults who play sports, and don’t use athletic mouthguards or full-face helmets to protect themselves, are also more likely to chip the front teeth. Figure 2: Bonding was performed on the tooth shown in the photograph in Figure 1. At the time of the photograph, it had been in place for six years without signs of failure. The tooth remained alive (vital) and showed no further symptoms. The use of an athletic mouthguard was encouraged for this active young boy. Back teeth frequently chip, but usually the cause is related to biting or chewing hard foods, like ice or popcorn kernels. This is especially true if the chipped tooth has large, internally-retained dental restorations (for example, fillings, inlays) present. Chips that occur at, or above the gumline are generally more favorable than cracks, which can extend deep within the tooth and allow bacteria to get inside the pulp. Also, since dental bonding became available, chips above the gumline are comparatively easy to fix—at least long enough to consider other options. With chipped teeth, each patient’s situation is unique. The size of the chip, the vitality of the tooth, as well as the patient’s oral habits, age, and general health help determine the treatment options. There are many different treatment options, including fillings, inlays, veneers, inlays, and crowns. How does the dentist diagnose Chipped Teeth? A chipped front tooth is typically very obvious. Patient usually report a chipped front tooth to their dentist. A chipped back tooth, on the other hand, may not be noticed by the patient until the dentist discovers the chip during a routine exam. Lack of awareness does not mean they shouldn’t be fixed, however. Among the dentist’s challenges with newly injured front teeth is to rule out more significant problems, like a serious head or neck injury that may have occurred at the time the tooth was chipped. Usually, this requires a review of the events that caused the chip with the patient or patient’s parent/guardian. If there is reason to suspect an even more significant injury (for example, if a child hit the dashboard in a car accident), or if other concerns such as abuse of the patient are suspected, the patient may be referred for additional evaluation, sometimes before dental care is provided. 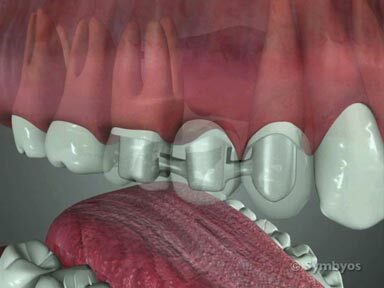 The patient’s general welfare must be considered relative to the severity of the dental injuries. When the patient is cleared for dental treatment, attention is turned to diagnosing the severity of the chip. If the pulp (nerve and blood vessel tissue) is exposed, the tooth will generally require root canal treatment (endodontics) before the tooth can be restored. Many times a chip is a blessing in disguise, in that the forceful blow to the tooth is dissipated in chipping the tooth (in much the same way as a bicycle helmet is designed to come apart in an accident, and prevent the victim’s head from absorbing the shock). If instead, the energy is transferred into the root of the tooth, the fragile nerve and blood vessels may be severed, and the tooth can abscess, requiring more extensive treatment. 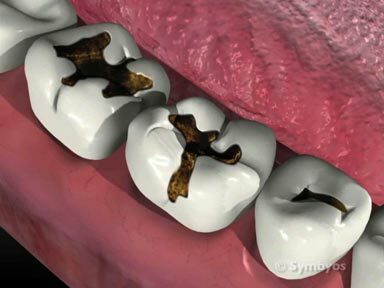 If a large portion of the tooth’s crown (the part you can see above healthy gums) has been lost, the dentist may recommend that a structural post be placed into the tooth’s root canal, and then build the crown of the tooth around it. This would necessitate root canal treatment before the post can be placed. However, modern bonding materials have again pushed the envelope of what is treatable without a structural post to new heights. How are Chipped Teeth treated? How the tooth was chipped, and the size of the chip, determines the options of how the tooth may be repaired. Smaller chips may be repairs with only a filling or dental bonding. Larger chips may require significant reconstruction of the tooth (core buildup). A veneer may be the best solution for front teeth which have chipped. For large chips, where there is significant future risk of the tooth fracturing, a crown or onlay may be recommended. If the pulp of the tooth has been exposed, or the tooth causes significant pain that does not resolve, root canal treatment is sometimes necessary. Sometimes teeth are vulnerable to chipping because of the way they contact the opposing tooth in the opposite jaw. 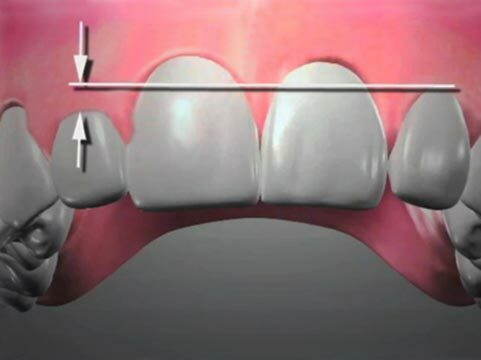 It may be necessary to adjust the bite relationship between the upper and lower teeth (equilibration) in such cases. If the teeth are poorly aligned, orthodontic treatment may be recommended. Teeth that chip as a result of grinding (bruxism) may need to be protected by an occlusal guard (even if the tooth has been repaired). Teeth should be protected by an athletic mouthguard for any sport that endangers them.